What’s not to love about an arsenal of cannons, lasers, and rockets? Not much, perhaps, but it does depend on how you use them. 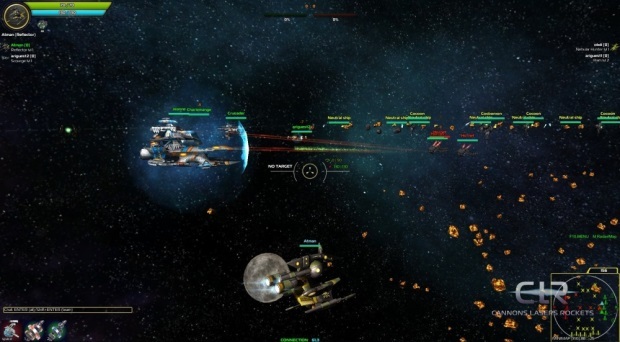 Net Games Laboratory is preparing for a November 2013 launch of its new title, Cannons Lasers Rockets (CLR for short), and just yesterday got the green light on Steam. We had a chance to get in-game with the developers and test through CLR’s current playable version to get a grasp on this space shooter. Let’s start from the first possible impasse: Cannons Lasers Rockets is a 2D space combat game – well, actually it’s not. 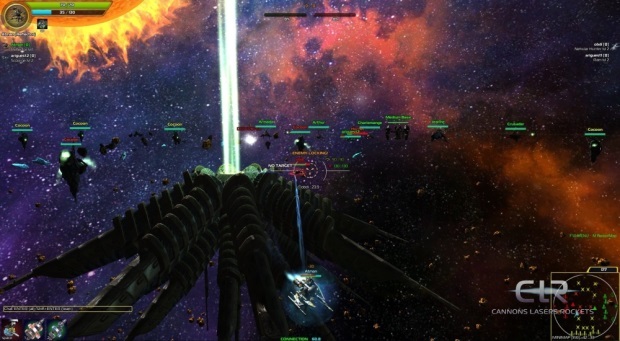 I come from an era where “space combat games” are synonymous with Wing Commander and Descent: FreeSpace, and while modern space combat has evolved to focus more on a third-person perspective than the confines of the cockpit, the full range of three-dimensional combat has been a defining feature of the genre. So in my first late night dabble into CLR’s tutorial mode, I was confident I was “missing something” when I couldn’t figure out how to make my ship fly up or down. Sure enough, I had missed the fact that this was an intentional game design, not simply a newbie error in learning game controls. For those of us seasoned in three-axis flight, CLR’s 2D design is jarring: after all, we can see the space, so why can’t we reach up and touch it? A little patience with the system is necessary: once you stop struggling against the non-existent z-axis, you can actually focus on paying attention to the battle spaces around you and stop looking for slinking ships outside of your peripheral vision. The flight system also lowers the game’s learning curve, making it more accessible for newer players. 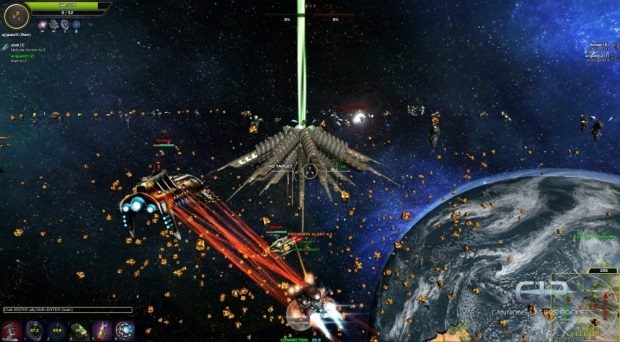 In short, you need to think of Cannons Lasers Rockets not as a space combat simulator, but as an arcade shooter, a third-person arena which just happens to take place in the free skies of space. With that sticky z-axis out of the way, let’s back up and take a look at just what CLR really is: a multi-player PvP arena, with arcade-style action and focused match-ups. In a gaming world currently overstuffed with third-person shooters and MOBAs, CLR manages to borrow ideas from both while remaining definitively neither. At the start of a match (co-op PvP boasts up to 10v10 battles), players are split into teams and sent into the hangar to choose a ship. There’s a wide variety of ships in Cannons Lasers Rockets, each designed to have a different feel in battle. In the demo’s tutorial, you’re given a generally mobile ship with a homing laser as its main weapon that can attack on all sides of the ship. Shifting into your own hangar choices, though, can leave you with a lightweight dog-fighter that can fly circles around its enemies but with some fragility. Or you could be like me, and pick the heavy-weight tanker with a turning radius that makes driving a semi look easy, with a straight-line torpedo launch from the nose. Net Games Laboratory promises “hundreds of ships” to experiment with and change to depending on the game mode and team composition. Ships start clean of any upgrades in each match, and players must earn experience in that particular match to upgrade them. Once experience is earned – from blowing up just about anything, including asteroids – you can head back to the shop at your base to spend experience on upgrades. Upgrades come in a wide variety, dependent on your ship class, and each comes with its own upgrade tier that costs more experience at each step. While this won’t get your heavy-built tank into a cruiser (and there’s no way to change ships after a match starts), you can still pick up some utility like stealth, while focusing on upgrades your ship or team needs to secure the match. Outside the match, you’ll be able to use a separate “currency” called reputation, which will allow you to customize the appearance of your ships and interface without affecting combat efficiency. So there you are in your first multi-player battle. You work out some strategies with your teammates, and get assigned to some grunt work for the early battle. Dutifully, you pull up your map and notice the battlefield is broken into circles connected by lines, each with a sector name – so what gives with this flowchart style map connecting two enemy bases? Once again, Cannons Lasers Rockets breaks away from the standard formula by breaking each battlefield map into sectors, which are small, circular arena chunks. While you can stray from the borders of these arenas into open space, you’ll take radiation damage – instead, you must go from sector to sector through transporters. Each sector is a miniature battlefield, with automatically spawning ‘creeps’ and AI-controlled defense ships. The deeper you head into enemy territory, the more dangers that wait for you – and of course, the closer you are to the enemy’s respawn sector. The mode we demoed was a little like a two-laned MOBA with miniature fighting areas that center and focus the action. For those used to free space and open movement, this is probably a second impasse. Net Games Laboratory explained to us that this not only helps fleet coordination, it keeps the game in a state of constant action, allowing players to jump in a sector even on break before hopping back out of the game. From our experience in our demo battle, we’ll certainly agree that these small sectors do keep the action locked in tight. However, due to different ship speeds and the necessity of transporters, it can take time to get back to the action when respawning. There’s also currently a lack of cooldowns on transporters, which means that someone could hang near them and swap in and out of an area in a heated battle to disrupt enemy fire – which we’re sure the team will address before full release. 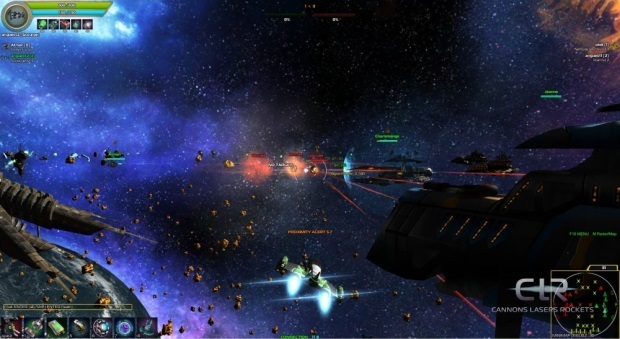 In a middle stage of testing and development – although just earning its Steam Greenlight on October 30 – Cannons Lasers Rockets is different in some promising ways. Although it has some design elements that may serve as deterrents for those looking for a familiar genre experience, the fact that CLR does things differently means that it’s offering a unique experience, not just cookie-cutter gameplay. If you dig sci-fi shooters and focused PvP competition, CLR is a title you’ll definitely want to keep your eye out for next month. Looks great. Did it take long to start a battle?